Have you been dreaming of brass taps and a freestanding bath? 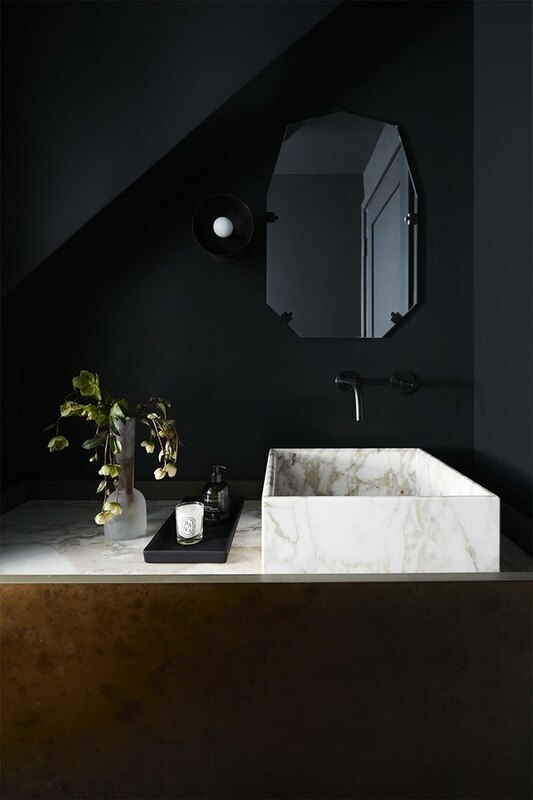 Or perhaps you're lusting after a black washroom with a marble vessel sink? Since bathrooms can quickly become one of the most expensive projects you can undertake, accepting your budget in the beginning can make all of the difference. And that doesn't necessarily mean you have to settle for less. There are a lot of budget bathroom ideas that'll give you the look and feel of a swanky lavatory, without the costly price tag. Take a look at our tips for creating a luxury bathroom for less. If you're on a budget, timing is key. By scheduling your remodel in-line with major sales such as Black Friday or Labor Day, you can save a few bucks on sought after fixtures and accessories. Bookmark your favorite items to keep a close eye on sales and sign up for newsletters to receive extra promotional perks. 2. Stick with your current layout. One of the biggest expenses when undertaking a bathroom remodel is the cost of plumbing. Chances are that your current setup is in place for a reason and works with your house, rather than against it, which will help you cut costs. So keep the pipes where they are and pick fixtures accordingly, this way you can use the cash you save for that freestanding tub you can't stop thinking about. 3. Salvage what you can. 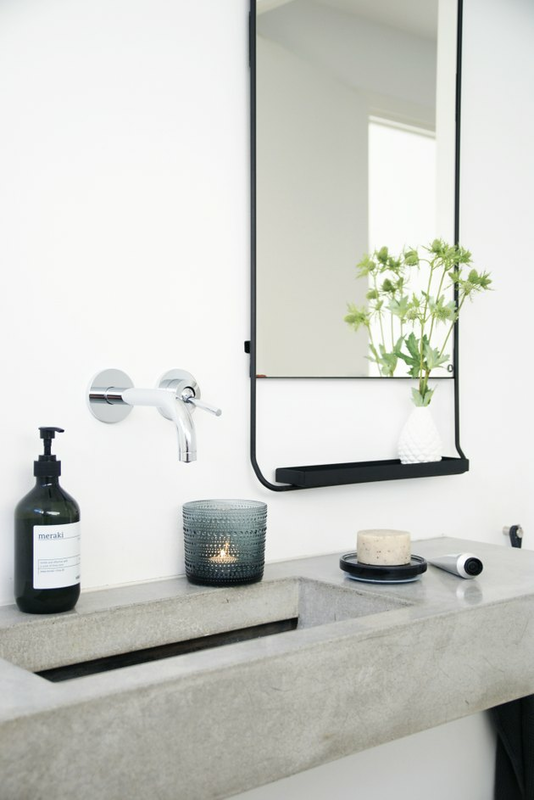 Another great budget bathroom idea: Take a look around and determine if there's anything you can utilize, upcycle, or sell. Some things just need a little bit of attention to bring them back to their former glory. 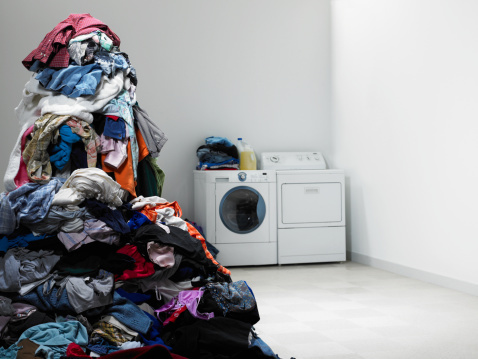 Don't forget to consider how these items will work with the rest of your plans, as you don't want to end up with a cluttered hodgepodge of items you don't really need and won't actually use. If you feel up to the challenge, try to take on as much of the remodel yourself as you can. DIYing is a great way to save money, learn new skills, and put your heart and soul into the project — but not at the expense of poor tile work or leaking pipes. A wonderful way to create a unique look without spending a small fortune is to search for vintage items. 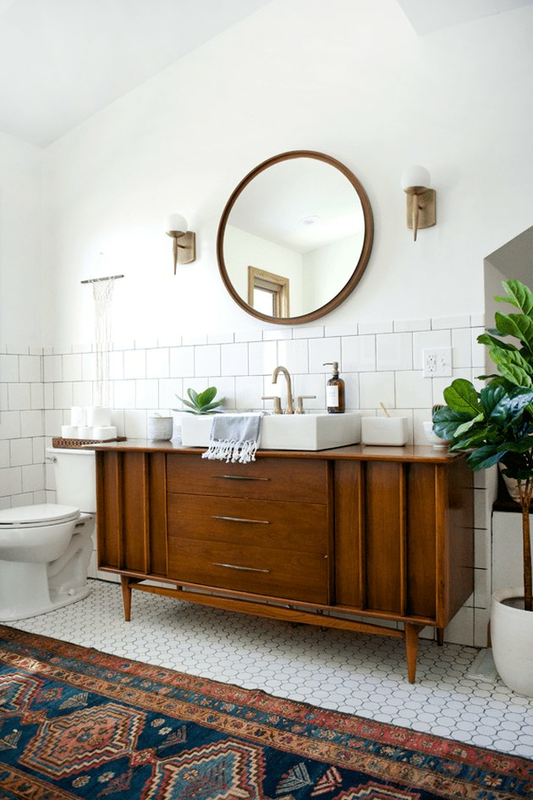 Old dressers and midcentury cabinets can easily be repurposed as bathroom vanities, and create a glamorous ambience, perfect for getting ready in the morning. Keep your eyes peeled for statement mirrors, fixtures, and accessories, too. 6. Go for simple tile. 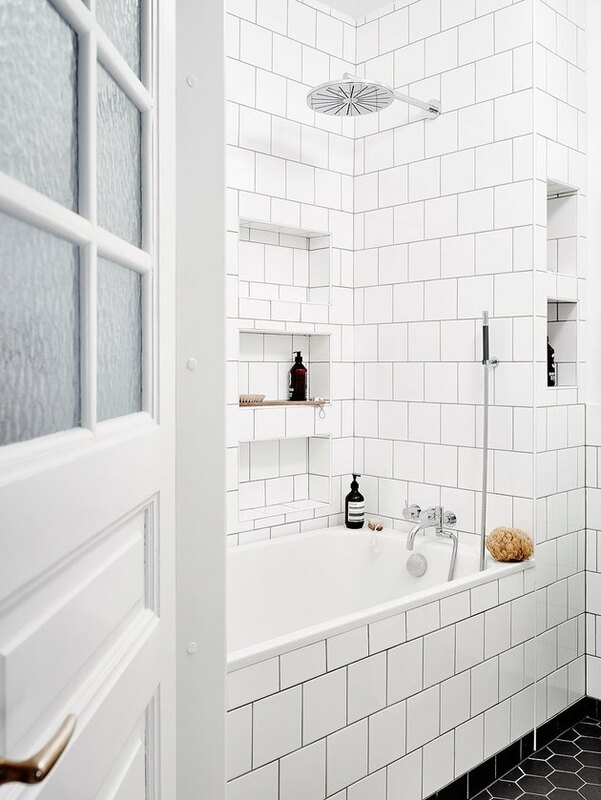 Statement tile can really spruce up a bathroom, but if you don't have the budget, simple white subway tile can create a clean and modern alternative that won't break the bank. Or if you really need (want) that little something extra, create interest in smaller areas with feature tile. Ceramic and porcelain tile are very practical and will last a long time; just be sure to give them the occasional deep clean. 7. Choose your paint color carefully. If you plan to keep tiling to a minimum, you need to consider the color you're going to paint the walls. Dark blues and greens add a sumptuous feeling to any bathroom and work well with basic white tile, elevating the look. 8. Consider your flooring options. Choosing a highly patterned design can give your bathroom that extra wow-factor. If a chic cement or ceramic tile isn't in the budget, the latest in vinyl flooring is well worth investigating. 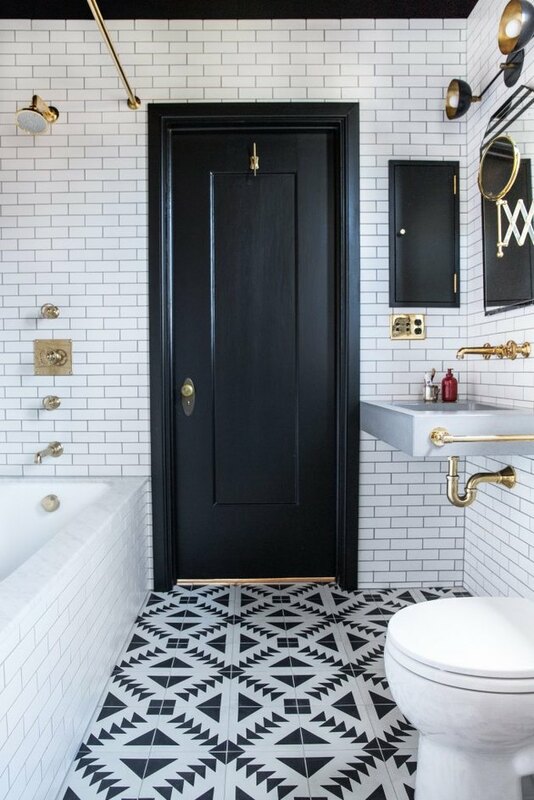 We're obsessed with the black and white geometric option used in this striking washroom designed by Katie Martinez. It's friendly on your purse and your feet, and can be easily replaced at a later stage should more money come in. If you have the space, a little trick that easily (and inexpensively) results in an elegant look is to add seating. A small chair or bench can infuse a spa-like quality and ensures your bathroom is the perfect place for primping and relaxing. 10. Go all out on accessories. Now that you've saved money throughout your remodel, you can spend a little more on luxe accessories. Plush monogrammed towels, opulent fixtures, unique storage, and leafy plants are final touches that add something extra and can transform your master bath into a hotel en suite.